Recording your seminar or presentation is at the core of our production. StudioSeminar will record it. In the studio or on site. Our technology and our employees are at the disposal of the presenter. Our aim is media-compatible information which is in line with market requirements. People remain at the focus. In this video, actress Jodie Ahlborn describes how the special recording system from StudioSeminar works. Your personal performance is just as important as the brilliant display of your charts. We therefore shoot your presentation, seminar, or lecture in a side-by-side process. This means: Both sides, the speaker and the monitor, are recorded simultaneously and synchronously but can be edited separately. This is the most effective way to record seminars and provides us with all the freedom to arrange your online seminars in the best possible way. You will find a comfortable ambience where you can concentrate and carry out your presentation in a relaxed environment at our partner studios across Germany and other European locations. Here you will find additional presentation technologies with which you can comfortably design and record your webinar. The best conditions for innovative e-learning and blended learning. Our high-quality, side-by-side recording system is also available for presentations and talks outside of our studio. 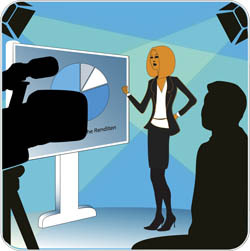 You can record a successful live presentation in StudioSeminar quality and hand it on. We enable video streams and transmit your seminar around the globe and live online or on your intranet. We support you during your presentation. We are experienced directors and actors, and our customers benefit from our professional handling of their presentations. From small presentation tips and notes about personal impact to detailed consultation, you can rely on our expertise at all times.